FOR RECORD GRADING DESCRIPTIONS PLEASE READ BELOW. 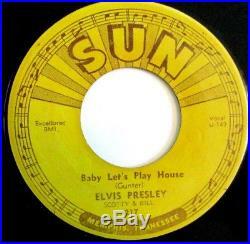 RECORD CONDITION: VG-/VG, THOUGH IT IS WELL PLAYED WITH MUCH SCUFFING- THE BEST PART IS THAT IT PLAYS GREAT, THE LEAD IN TO "BABY LET'S PLAY HOUSE" DOES HAS SOME STATIC JUST BEFORE THE SONG STARTS. PLEASE REFER TO PHOTOS IN THIS LISITING AS THIS IS THE ACTUAL ITEM YOU WILL BE RECEIVING. OFFERS AND OTHER IMPORTANT INFORMATION TO INSURE THE SAFE ARRIVAL OF YOUR PACKAGE. All vinyl is visually graded\as described below, If I see any imperfections (such as feel-able marks) that might cause a problem on playback I will play through that area to determine if there is any affect on the music and will make note of that in the description. VINYL THAT IS MINIMALLY PLAYED AND VERY WELL CARED FOR, MAY HAVE A MINOR IMPERFECTION THAT WILL NOT AFFECT PLAY. VINYL WELL CARED FOR - MAY HAVE A COUPLE OF MINOR IMPERFECTIONS THAT WILL NOT AFFECT PLAY. VINYL HAS THREE OR FOUR MINOR IMPERFECTIONS , MOSTLY SUPERFICIAL SCUFFS/MARKS, IT HAS RETAINED ITS GLOSS AND MIGHT PLAY WITH MINOR. SURFACE NOISE, MOSTLY BETWEEN SELECTIONS, BUT NOTHING DISTRACTING. MOST PLAYED BUT WELL CARED FOR VINYL FALLS INTO GRAY AREA BETWEEN VG+ AND VG++, NOTHING FEELABLE, SOME SCUFFS AND OR MARKS TO THE SURFACE-SHOULD PLAY NICELY WITH VERY MINIMAL DISTRACTION. +: VINYL HAS QUITE A FEW NOTICEABLE IMPERFECTIONS. IT MAY PLAY WITH SOME SURFACE NOISE BUT DOES NOT OVERWHELM THE MUSIC. SOME GLOSS LOSS IS EVIDENT. VINYL HAS NUMEROUS IMPERFECTIONS AND/OR A MAJOR FLAW OT TWO, GLOSS MAY NOT BE PRESENT FROM EXTREME PLAY - DISC PLAYS WITH SURFACE NOISE BUT MUSIC FAIRS WELL. GOOD/G to VERY GOOD MINUS/VG. VINYL HAS MAJOR IMPERFECTIONS AND LOSS OF SHINE AND WILL PLAY WITH NOISE BUT NO SKIPS-UNLESS NOTED. IF YOU PAY USING THE FIRST CLASS RATE YOU AGREE TO ASSUME ANY RISK OF LOSS OR DAMAGE. DOUBLE AND TRIPLE LP SETS COUNT AS 1 ITEM. ALL RECORDS ARE VACUUM CLEANED AND PLACED IN NEW PAPER SLEEVES OUTSIDE THE COVER. PLEASE WAIT FOR THE INVOICE TO BE SENT TO INSURE PROPER CHARGES AND CHANGES HAVE BEEN MADE! I TRY TO BE ACCURATE IN MY DESCRIPTIONS AND OFFER TOP SERVICE TO MY CUSTOMERS. BUT IF I MAKE AN ERROR I ATTEMPT TO RESOLVE ANY ISSUES AS QUICKLY AS POSSIBLE TO YOUR SATISFACTION. 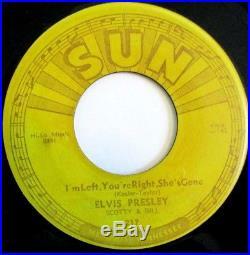 The item "ELVIS PRESLEY SUN ROCKABILLY 45 BABY LET'S PLAY HOUSE/I'M LEFT YOU'RE RIGHT" is in sale since Monday, October 09, 2017. This item is in the category "Music\Records". The seller is "nickscoollectables" and is located in Howey in the Hills, Florida. This item can be shipped worldwide.